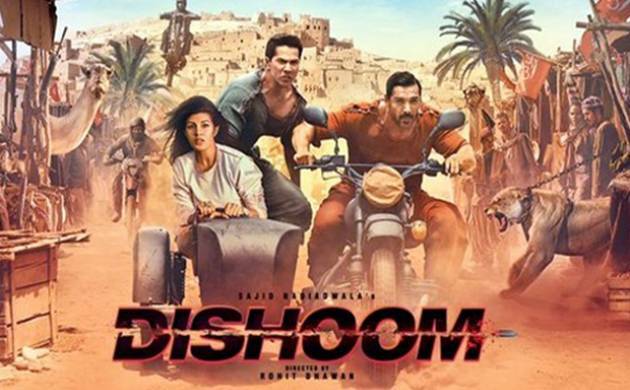 John Abraham and Varun Dhawan starrer Dishoom, which released in theatres today, is a power packed action-adventure drama. Director Rohit Dhawan sticks with his two-man lead formulae from 'Desi Boyz' but fails to deliver an improvement over the same. To begin with, the film appears to be a thriller but ends up being a handsome punch of entertainment with several hiccups. 'Handsome' because of its male protagonists, who own the screen every time they project their toned eight-pack bodies with a style statement. For John Abraham it's his trademark tough guy look while for Varun Dhawan, his over the par happy-go-lucky image does the job. They both are on a mission to save the life of India's favourite son (as antagonist claims) Viraaj (Saqib Saleem), the in-form Indian cricket player, abducted by a bookie Wagha (Akshaye Khanna). During the hunt, the audiences are injected with several other characters (mostly cameos) - Akshay Kumar, Nargis Fakhri and Parineeti Chopra. Mr Khiladi remains the highlight as he strips down the leads from the ease of his jet ski. In terms of hiccups, the major one remains with the wastage of talented actors. Akshaye Khanna, making a comeback in Bollywood, only managed to impress with his looks and not the act. Blame it on Hussain Dalal, the writer, who handed him a mobile phone to play the deadly game of life and death; may be a face-off could have added some flavour to the movie. Saqib Saleem, Filmfare nominee for his debut movie Mujhse Fraaandship Karoge, has also been not utilised to his calibre. The actor barely has five dialogues in a film that entirely revolves around his character. Director Rohit Dhawan also added to the damage by keeping his focus on the lead actors – John Abraham and Varun Dhawan. He finds it difficult to evade the tried and tested industry image of the stars, leaving the plot short of potential. There is a huge deficiency of actual punches which are required to run an action-drama. While, Dishoom presents hunt for Viraaj, the confused audiences are left with a quest to categorise the film into various genres – action, comedy, thriller or another Bollywood illogical drama. Music by Pritam da also turns out to be very ordinary and loud at several occasions. The songs may entice with their tunes but they come with no reason to stay long in the chart beats. Final Verdict: Watch it only if you are a hard-core fan of either John Abraham or Varun Dhawan. Red Alert! No substance just style to attract audiences.